Leighton Buzzard couldn’t capitalise on their flying start as they went down 27-19 at home to fellow Midlands 1 East strugglers Paviors. 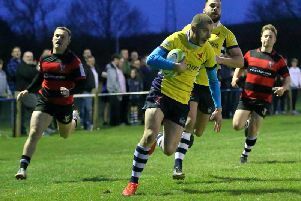 Leighton Buzzard had two tries on the board inside the opening 10 minutes at Wrights Meadow, but even with a 12 point advantage, couldn’t withstand the second half onslaught from the Nottinghamshire side, and ended up on the wrong end of the reverse. Having lost the toss, Leighton kicked off with the benefit of the slope and a gentle breeze. Often slow starters, for once the Buzzards flew out of the blocks. Pressure was created with fine angled kicks to the corner –and after good work from the pack, Zak Tift drove over. Lee Walker converted to give Buzzards a 7-0 lead after just five minutes. Better was to follow only five minutes later - a fine break by full back Darren Braybrook was held up just short. As the recycled ball went loose, prop Ashley Walsh kicked through and reacted quickest to touch down. Although the conversion was missed, Buzzards led 12-0 after 10 minutes. Paviors slowly worked their way back into the game – their set piece was rock solid and as they controlled possession, the pressure on the Buzzard defence was relentless. But the home defence was committed and it took until the thirty-first minute before the line was breached for the first Paviors try. Nine minutes later and with the last play of the half the Paviors pack drove a rolling maul over the line. With both conversions missed Buzzards led 12-10 at half time. The second half started in a similar vein to the end of the first half – the large Paviors pack monopolising possession and again the pressure told – after four minutes creating space for the Paviors fly-half, who had an excellent game, to score in the corner. The Buzzards were now behind for the first time in the game (12-15) and continued to use their limited ball to attack when possible. However not helped by yellow cards to Ashley Walsh and Darren Braybrook and injury to pack leader Zak Tift, further tries were conceded after 11 and 24 minutes to leave Leighton trailing 12-27. As seen many times this season, the Buzzards showed fight in adversity. Captain Euan Irwin was unlucky not to score after being tripped in a race for the line – the referee deciding that a yellow card rather than a penalty try was the appropriate decision . Finally Leighton’s endeavour was rewarded with a try with three minutes left scored by Arran Perry and converted by Lee Walker to leave the score 19-27. Buzzards knew that a further try would result in two bonus points but Paviors played the remaining time out without difficulty to leave the final score 19 -27. Buzzards remain in the third relegation place and next week are away against Bugbrooke.